Tim Patrick. Credit: Stan Szetso, USA TODAY Sports. The Denver Broncos have generally struggled to find a reliable No. 3 wide receiver since Wes Welker left after 2014, but there is reason to be excited about the future of the receiving corps. After cycling through failed projects like Bennie Fowler and Cody Latimer, the Broncos’ luck appears to have turned around with the talented, young trio of Tim Patrick, Courtland Sutton and DaeSean Hamilton. With the Broncos moving on from Demaryius Thomas this past season and an aging Emmanuel Sanders recovering from a torn achilles this off season, the three wide outs will look to continue to increase their roles in the passing offense in 2019. But, what many Broncos fans wonder is whether or not the team should just completely buy into getting younger, and move on from Sanders as well. Emmanuel Sanders was having one of his best seasons in the Mile High City until he tore his achilles. Sanders had a career-best catch rate of 72.4 percent, while catching the second-highest amount of passes per game in his career (5.9). Unfortunately for Sanders, the lone veteran could find himself on the way out of Denver if the front office decides his contract is too steep to justify this fall, especially with the emergence of the young guns in 2018. One of the few bright spots in a generally dark season for the Broncos was the emergence of Tim Patrick. Patrick, 25, arguably showed more improvement than any of the young pass catchers on the roster. Over the first 12 games of the season, Patrick was targeted a mere 11 times and only came away with four receptions. 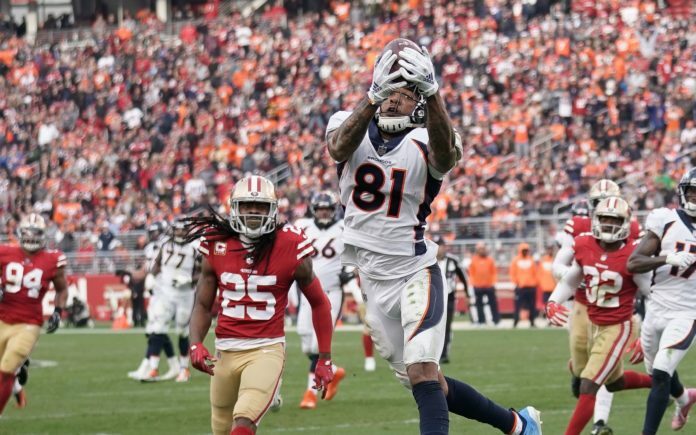 But, over the last four games of the season, Patrick exploded for 19 receptions and 242 yards on 30 targets, while looking like Denver’s most complete wide receiver on the field. Courtland Sutton had a bumpy rookie season, but definitely displayed flashes of greatness. The former SMU star proved to be a reliable enough deep threat that it allowed the Broncos to trade away Demaryius Thomas, but once the long-time veteran was no longer in the picture, Sutton did not perform as well with the increased attention that opposing defenses showed him. After averaging .375 drops per game before Denver dealt Thomas to the Texans, his drop rate doubled to .75 drops per game. In total, Sutton dropped nine passes this season, the second-most in the league according to Pro Football Focus. Despite the drops, Sutton’s production was solid for most of the season, and the rookie wideout combined with DaeSean Hamilton, Phillip Lindsay and Royce Freeman to record the most yards ever gained by a rookie foursome. It will be exciting to see if the 2018 class can take another step in 2019. The only receiver the Broncos would likely consider moving on from this offseason is Emmanuel Sanders, due to his age and recent injury history. There are some intriguing free agent options that Denver can consider, but with limited cap space, it seems unlikely that the Broncos would be able to bring anyone in that would be an upgrade to Sanders. Two of those enticing options include Golden Tate and Randall Cobb, but at this point it remains unclear if the Broncos will seriously hunt the open market. The more logical scenario for the Broncos would be adding another receiver through the NFL Draft. The 2019 wide receiver class is fairly shallow, but there are still plenty of explosive weapons that could help replace Sanders’ production if the Broncos do move on from No. 10. The biggest problem for Denver is most of the top prospects are similar to Sutton’s style and would not replicate Sanders’ electric speed. Both Ole Miss receivers A.J. Brown, and D.K. Metcalf are excellent jump ball receivers but neither are considered track stars, and the same can be said for Arizona State’s N’Keal Harry and Iowa State’s Hakeem Butler as well. If the Broncos do decide to target a receiver in the 2019 draft, Denver should aim for one of the quicker playmakers like Oklahoma’s Marquise Brown. Other interesting options could be South Carolina’s Deebo Samuel or Georgia’s Riley Ridley. Samuel has had a great week at the Senior Bowl and could be the Broncos’ personal version of Tyreek Hill, though not quite as fast. Ridley was underutilized at Georgia, and may not be as athletic as his older brother Calvin, but he is an excellent route runner that should have early success in the league. What should the Broncos do? The Broncos should sit tight with Sanders for one more season, and then draft a receiver in 2020. Denver will likely pursue a quarterback this April and if the Broncos do have a rookie to build around, keeping a veteran like Sanders in the locker room makes a ton of sense. Besides, next year’s draft is set to have an absolutely loaded class of receiver talent, with players like Colorado’s Laviska Shenault Jr., Clemson’s Tee Higgins, and Alabama’s Jerry Jeudy all being eligible. Denver can bring in another wide receiver in 2020 and focus on improving the offensive line this time around.